This work is licensed by SS under a Creative Commons Attribution-NonCommercial-NoDerivs 3.0 United States License. Content and pictures are mine unless stated otherwise. Please contact me if you have questions or for use of content. I will be glad to share my crusade experience with a wider audience. Life is all about making right choices. One as simple as buying your yoga mat can make a difference on your carbon footprint. Do you know that a standard mat sold as being suitable for yoga is made of soft PVC (Poly Vinyl Chloride) a non earth friendly non bio degradable material. You must have noticed a strange stinky odour emanating out of a plastic mat, slipper or a bag for that matter. Imagine all the fumes this mat may be releasing into the air and its impact on air quality with in your house.Why force yourself to live that way when you can make smart eco-friendly choices? 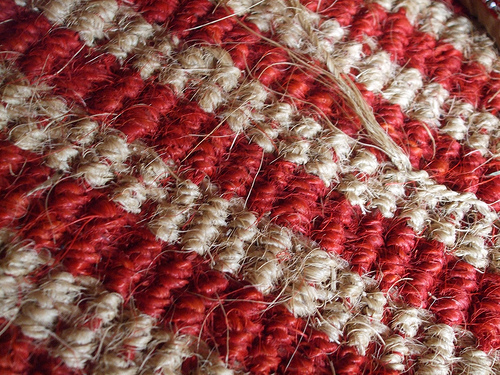 Yogis and Sages in India were known to have used straw mats for meditation. In fact, using a Dharba grass mat is considered auspicious in hindu homes. With major changes in lifestyle and the increased need for a cushy support for our bottoms, yoga mats have become a must have. Off late, people seem to "need" Yoga pants and yoga mat for their sessions. Kudos to all the ad gurus! beautiful Sitalpati (sheetal-cold) mats from Assam, India. and the coir mats from Kerala to name a few from with in india. If you were go International, Japanese Tatami mats need a special mention. Did you know that Japanese home design techniques make use of a tatami mat (ideally 6ft x 3ft- ideal human scale) mat to design their homes. This is measure between columns in a house. 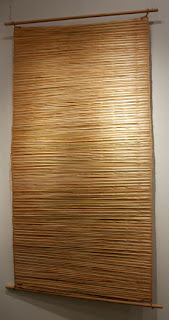 Straw mats from korea are called whamunseok, deungmae, dotjari. The most popular mats in Korea are woven of split stalks of sedge or any other straw. Banig sleeping mats from the Philippines, are made from locally abundant palm leaves, sear grass or pandan depending on the region of Philippines a mat comes from. We also have handicrafts from Peru, Cuba, Chile, Brazil, Mexico and not to miss hand woven mats/rug original to each of the 300+ native American tribes. Cattail mat being one of them. I am not quite sure if more than one tribe made these mats. You may click on cattail for more about it on wiki. As I mentioned earlier, straw and plant handicrafts have had an intrinsic and important cultural meaning for every civilization across the world. Traditionally crafted products are always eco-freindly. Why so? beause people dint have access to plastic back then!..lol. 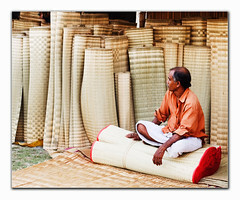 Once you have made your choice of straw mat, just could walk into any local handicraft store to pick one for yourself. If these seem out of your budget, a simple cotton / jute durry will work well too. 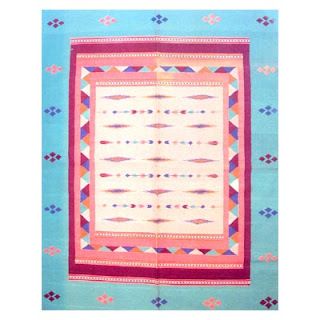 Though not made of straw, this beautiful and authentic Navajo rug (Arizonian) could be a good choice for a yoga mat. A few other reliable options: Warangal durry, Andhra Pradesh India. Why buy a stinky plastic or a PVC mat, when you have such wonderful options to choose from,. Make a wise choice, live well and take care...See you soon. WOW ! a mini encyclopedia on mats !Loved this post. Glad to report that korai-paai and Jamakkalams are still very much in use in this part of the world. Just last month, for a wedding in the family, one traditional "seer" item was the pattu jamakkalam with the bride's name woven on the borders ! Now your post about mats looks complete. Its really good and interesting to know about the varities of mats available around the world. Thanks for publishing alternate types for plastic mats. I hope there will be good response for this. I require details about Madur mats from West Bengal. What are the types grass called Madur Kathi? What is the Scientific name of that grass? Very interesting post! Thanks for sharing some of your favorite recipes. If you're interested in other healthy ways to get fit I would definitely recommend yoga. In fact, Kulae offers some excellent wholesale yoga mats via their website. These are excellent mats! Starbucks - Left me alone....and they say - Don't Do it Alone!! My blogs and my thoughts are what I am. See you around! My weblog is my journey towards a greener living...I am not into any fad or being green for the sake of it. I feel very strongly about what I write. Bag and the Blog mentioned - Image linked to the post!